Cheap flights from London to many destinations in South East Asia £283! If you appreciate the cheapest option available check out below deal based on promotion of Shenzhen Airlines. The carrier has released new set of discounted flight for next travel period. 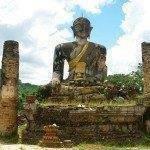 You can book cheap return flights from London Heathrow to many destinations in South East Asia. Return flights to Bangkok, Phuket, Phnom Penh, Hanoi, Kuala Lumpur or Jakarta are available already for £283 incl. all taxes and fees, meals and checked luggage. Flights have one layover in Shenzhen in China. Promo tariff allows to build open-jaw tickets or you can book multi-city flights and visit one of cities in South East Asia and China at once..
You can complare all travel dates to your destination via Google Flights. Shenzhen Airlines promotion is available when departing from London to Asia from 21st to 28th of March or 21st of April to 14th of June 2019. Max stay 45 days. Discount is valid for bookings made by end of March or until sold out..
Booking sample of cheap flights from London to many destinations in South East Asia from £283 return! In this case you would deaprt from London Heathrow to Bangkok on 10th of May. You would return from Asia back to the United Kingdom on 24th of May 2019.